Where Piaget meets Pink, where Dewey meets "Do Now"
It’s the age-old “optimist or pessimist” question: do you see this glass as half-empty or half-full? As it turns out, there are a variety of ways to answer that question outside of the “either/or” choice provided, and that could tell you a lot more about how you (and those around you) perceive the world. For instance, this website contains a collection of funny one-liners imagining different professions answering the question. An engineer might see a glass that’s twice as big as it needs to be, while an entrepreneur sees a glass undervalued by half its potential. And when I’m asked that question, I generally respond with a smarty-pants science guy answer: “You know, the glass is ENTIRELY full. It’s just half-filled with water, and half-filled with air!” #nerdalert, I know. 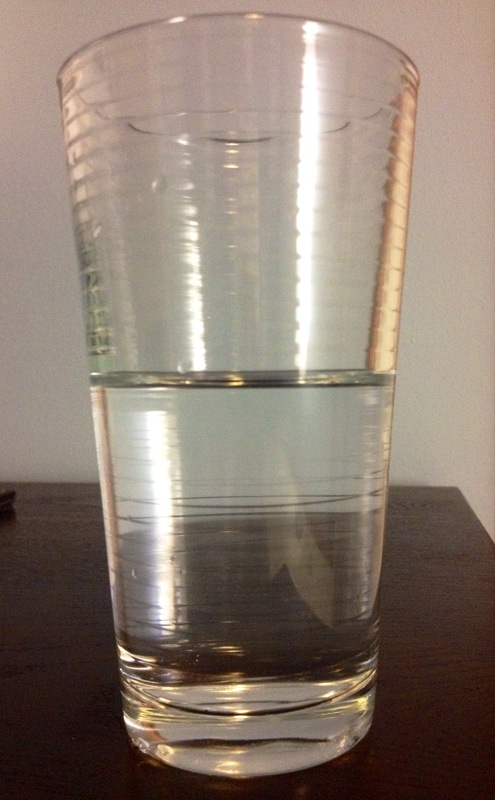 If you had this glass of water, what would you do with it? It’s kind of funny to read in this context, but I really do think that this little vignette encapsulates the wide variety of perceptions that different people tend to have about the exact same reality in the face of potential change. So, what does this all mean for leaders wrestling with organizational change? Come to grips with your own lens. How do you tend to perceive the situations your organization faces? Are you more of a Daredevil, seeing only the value of change without any of the costs? Or perhaps more like the Skeptic, noticing many more of the costs from the outset? Understanding yourself may become a window into your own values when it comes to leading change, and could help you uncover potential blind spots you might not naturally see. Incorporate the viewpoints of counter-perspectives into your own vision. It can be a challenge to let your inner voice be quiet enough to recognize the truths in what you hear in viewpoints opposing your ideas for change. That does not make these viewpoints any less valid. If you tend to see the “glass half full,” go find a Skeptic who easily sees inherent costs, and present them with your idea for change. Holes will be poked, no doubt. But these are holes that you can fill, which will make your plan much richer as a result. Listen for the lens that others are using, and let it inform your communications. The better you can understand others, the more likely you know how to engage them in the change process. Know a Daredevil who always tends to “jump right in”? Recognize that they’ll jump right in (though be wary if they don’t, and ask them why they didn’t). 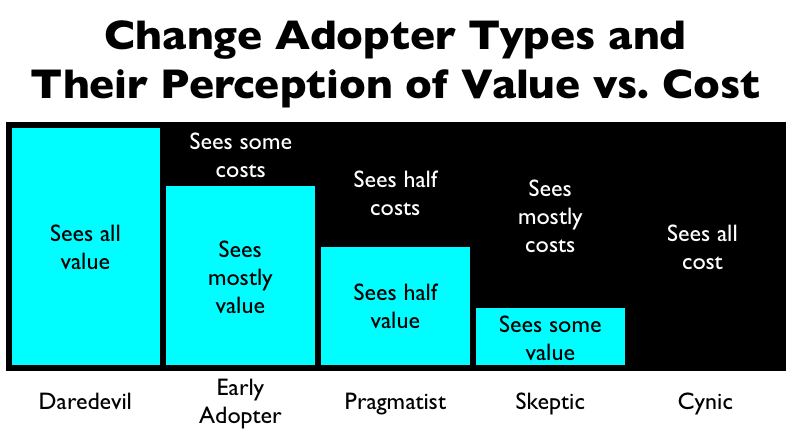 Pragmatists, however, may need a model before they’ll consider changing- consider enrolling your Early Adopters to help you build one. And the Cynics? They may never enroll- not until the change no longer looks like a change. Let’s stop arguing “either/ors” of heads & tails and realize what we have is one coin. Then we can spend our time figuring out what that coin is worth. A couple of weeks ago, I shared a brief anecdote of how tackling a problem like mosquito bites can help us better understand school improvement. That story shed light for many on the recurring pitfalls that leaders tend to encounter in the process of strategic planning for organizational change. Such a story might be a helpful way of thinking about reaching goals in the short term, but what if the goal is more long-term? Like perhaps…school improvement for student success? Or even…getting good golf scores? Can employing the thought behind strategic planning help a duffer like me start to shoot for par? And more importantly, can describing a focused approach to becoming a better golfer really help to reframe strategic planning for school improvement? After more than a few good walks spoiled, I’m willing to give it a shot. I’m far from a good golfer. Up until this past spring, I rarely played. But for some inexplicable reason, becoming better at the game has been on my to-do list for years. Call it a beaten pride, a thirst for learning, or one too many spoiled walks: after my annual round this Spring Break ended up in the mid-130s again (60+ shots worse than the par of 72, for those unfamiliar with the game), I felt a need to improve. But how would I get better? So far, all I knew is that my goal was to get better golf scores, and my strategy was to get better at golf. That statement could neither be more true nor less helpful. It didn’t help me know how to act. I decided that I needed some short-term goals, and some indicators of success toward those goals. Up to that point, the only thing I “tracked” on the course had been my score, the number of times I struck the ball on each hole before hitting it into the cup. So I downloaded an app to help me keep up with more than just my scores (MyCaddie Pro, for those interested in a great app that doubles as a GPS course map), and tried to decide what to start looking at. One of my former students happened to be (and still is) a stud golfer, and he gave me some advice years ago that suddenly came to mind: “If you want to improve your score and you can only practice one thing, practice putting.” Remembering that my last round felt as if it had far too many putts, I decided to use that as my short-term goal: hit fewer putts per round. More specifically, my goal became to get my average number of putts per round near 36 (an average of two per hole). Naturally, my indicator was number of putts per round. While I had no strategy to reach this goal, at least I had a goal, one that felt attainable. And then, I went to play. And over the next three rounds I played, I noticed I still had pretty high scores, without any clue as to how to improve them. After averaging around 43 putts per round (7 higher than my goal), how was I supposed to get any better? Looking at my scorecard, I noticed an interesting trend, one that helped me recognize that perhaps I was viewing my goal all wrong. (How often does that happen in the process of school improvement?) In a classroom situation, I would give you a copy of a couple scorecards and let you look for any trends in putting scores yourself. Why not do the same now? Instead of revealing my own thinking, I’ll share another set of scorecards, all collected after having reframed my putting goal (and thus shifting the indicator for success accordingly). Notice anything different about the putting scores? Well, for one thing, the scores are lower: 5 putts better per round, on average. I’m sure that a large part of that improvement has to do with continued practice. Personally, I attribute that success to one thing: I reframed my goal based on trends I saw in the data. I started this experiment with the short-term goal of getting my average number of putts per round to 36 (an average of two per hole). In the first group of scores, I noticed that I had far too many holes with more than two putts. I realized that I would never reach my goal until I eliminated those 3-putt and 4-putt holes. I have now reframed my goal: to reduce the number of holes where I have more than two putts. As a result of the reframed goal, my indicator of success is the average putts per round the number of holes per round where I had two putts or less. It may seem like a semantic difference, but this clarifying change has brought to light a strategy that has helped immensely in my putting. Since my goal is now to reduce the number of holes where I putt more than twice, I have taken to the strategy of not necessarily trying to make the first putt. Instead, I now imagine a hula-hoop up to 5′ in diameter surrounding the hole; my strategy is, with my first putt, I try to hit the ball into that imaginary hula-hoop. My thinking is that I’m not realistically going to make too many 20-foot putts. How many of those 20-footers can I get within three feet? Because I can tap in from three feet without a problem. It sounds a little hokey, but this strategy has helped me to hit far fewer 3- and 4-putt holes, while still knocking down the occasional long-distance shot on the first putt. What does ANY of this have to do with School Improvement? Playing golf is one of my breaks from thinking about work, and yet I find myself thinking about work a lot while playing golf. Funny how that happens, isn’t it? In the process of School Improvement, it is so important not only to have a goal, but to have the right goal, one that is clear and “actionable” (if that’s even the right word for this context). In this golf example, I had a fine goal, but it wasn’t until I reframed that goal that an effective strategy became clear. In school improvement, how often do we settle for the first goal, instead of thinking long enough and hard enough to find the right one for right now? Also, just as in my mosquito example from the last post, the indicators here are directly tied to the goal in question. I don’t keep data on how far back I pull my club while putting, or where I put my feet relative to my hands. Instead, I tie the indicator directly to the goal: number of putts per round, number of holes per round with more than two putts. Just like the importance of the clarified goal, there was a certain power in landing on a more purposeful indicator, one that more directly measured the issue I was seeing in my game. While keeping up with the number of greater-than-2-putt holes may be a bit more challenging than tracking total putts, it is a much better indicator for the issues in my game. In school improvement, how often do we settle for the indicator that’s easy to measure, instead of thinking long enough and hard enough to find the ones that are important and purposeful enough to measure? Finally, while I keep those indicators on my scorecard in front of me at all times, my focus on the actual course stays on the strategies I have chosen in order to impact those indicators. While playing, I’m not thinking about getting par; I’m trying to hit a solid tee shot. On the green, I’m not concerned with reducing my number of 3-putt holes; I’m trying to putt the ball into that imaginary hula-hoop. Sometimes, strategic plans take on a life of their own, causing those involved to forget that the purpose of the plan is to help us know how to act. After choosing a path, schools must put their energies into fully implementing the strategies they have identified in their plans, while keeping their eyes on the chosen indicator to see if their work is having the desired effect. It seems like both the most difficult and the most important part of strategic planning: studying the right combinations of actions and results to see if our work leads to the desired outcomes. As for me, so far I’m happy with the results of my little “hula-hoop” strategy, and I am confident that it will help me get better golf scores (the long-term outcome, in my case…aside from having fun, of course). Next, I’ve decided to start tracking the number of fairways I hit with my tee shot. After one round of tracking, I’ve noticed that I miss to the right of the fairway A LOT. Like, “missed-right-of-all-but-one-fairway-in-a-whole-round” a lot. While I have no strategy as of yet on how to get the tee shot going straighter, I’m hopeful that keeping track of it will help me enjoy a few more good walks in the future. I was sitting on my porch this evening, doing a little of the three R’s – ‘riting, reading, reflecting (sorry, math folks…no ‘rithmetic this time) when I noticed a minor annoyance. Pesky mosquitos slowly buzzed their way onto my legs, as they are wont to do on a balmy evening in central Virginia. At least, I assumed there were mosquitos, as I did not see or hear any of them. All I had to show from their visit were a couple of red bumps on my calves. Bumps that slowly started to itch. And itch. And itch. While I started to scratch my leg to relieve the uncomfortable sensation, I knew that I had found a problem: I needed to stop these bugs from biting me. As I continued to write, I became more aware of the mosquitos in my surroundings. I saw a few flying around the porch, and would periodically notice one land on my leg. That sense of awareness was of course followed by a quick and thorough intervention: with one swift smack, the couple of bugs I caught lay dead at my feet. While I may end up with a slight bruise at some point (as I think I was a little overzealous with my slaps), “crisis” had been averted. Unfortunately, I was not able to catch all of the bugs in this way: before I knew it, two more bite marks surfaced on my legs. It would have been easy enough to go inside for my 3R’s time, but I was a little hellbent on enjoying the evening air. I realized I needed a new plan. I remembered that we had some Off! spray in the house, and decided to go in and make use of it. At the same time, I noticed one of our citronella candles next to me, and realized that lighting the candle may help. Walking inside, I grabbed the bottle of Off! and a box of matches. After spraying my legs and arms, I proceeded to light the candle and bring it next to my spot of intended repose. Hopefully, I thought, this plan will work. How will I know it worked? Well, for starters, I’ll end up without any new welt marks as a result of these bug bites. Sure enough, over the next twenty minutes, I was not bitten by a single additional mosquito. As dusk approached, I celebrated in my success, blew out the candle, and headed inside. But What Does It All Mean, Basil? Naturally, I went to my “organizational change” place and put this situation into that context: how would this situation have been written using the language of school improvement? GOAL: Stop these bugs from biting me. What can we learn by focusing on such a mundane event? Secondly, while my strategy did change mid-stream, my goals did not, and neither did my indicators of successful goal attainment. In my mind, indicators are inextricably tied to the goals: they are the measure of progression toward reaching a goal, and would not change just because the strategy has shifted. It makes me wonder, how often do we change our indicators based on a shift in strategy? Admittedly, I did not do a very good job of isolating my strategies. In the future, I have no idea which strategy was helpful in repeling the mosquitos: the candle or the Off! spray. At this point, all I know is that to avoid being bitten, I should use both the candle and the Off! spray. In that sense, how often do we combine multiple strategies in our plans for improvement to the extent that we would be unsure of how to replicate success? Finally, part of the success of this “plan” was rethinking the implementation strategy. My first response had been to consider ways of killing the bugs. Had I continued down that path, I may have ended up with a flyswatter in place of the candle, or a fumigator in place of the Off! Instead, by rethinking the strategy from “exterminate” to “repel”, I came to a solution that was helpful. If I wanted a long-term solution in this realm, I could always screen in the porch or something (though I had neither the time, expertise, or desire to do so this evening). There were a myriad of other options, each of which may have been just as effective in achieving my goal. The question is, of all the responses I could have, which of these strategies best fits this moment in time, for this situation? Hope this post is neither too simplistic nor too esoteric- just thought I would share a couple musings around school improvement from a guy who is now in desperate search of some Bactine.